This qualification provides you with all of the necessary skills and experience to apply for roles as an Aviation Transport Protection Officer. $200 OFF courses for April dates. Usually $990 – now $790! No further student discounts apply. Aviation Transport is a nationally significant critical infrastructure sector to ensure the continuity of essential services in the face of all hazardous events including pandemic, terrorist attacks, cyber crime and natural disasters. 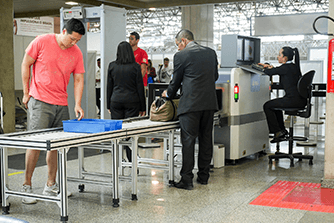 The Australian Department of Home Affairs – Aviation and Maritime Security (AMS) Division recognises the Certificate II in Aviation Transport Protection as a benchmark standard for security personnel employed in the sector. In order to become an Aviation Protection Officer – you must also have completed a minimum Certificate II in Security Operations. Participants for this course must have completed a Certificate II or Certificate III in Security Operations prior to commencing this course. Sufficient language, literacy and numeracy skills to be able to read, comprehend and comply with legislation, organisational policies and procedures, record observations, draft reports, and communicate in clear English is essential. Basic to intermediate computer skills are also required. Participants should not have an injury or physical disability that prevents them from standing for long periods, lifting luggage or visual impairments that prevent them from accurately and consistently monitoring images on a computer screen for continuous periods of up to 20 minutes. Prior to enrolment participants will be required to undertake an Online LLN ASSESSMENT. This course is delivered face-to-face over 5 days supported by self-paced assessment workbooks. Depending on the location of the course, participants studying the full Certificate II will undertake one day of training and assessment in a live screening facility during this course. Recognition of Prior Learning is available for this qualification. Course fees may vary depending on location and delivery mode of the course.